Should you buy a smoker's house? This question may confront you once you feel you've found the perfect place ... except for that ashtray smell permeating every single room. Is this a deal breaker? If the smell of cigarette smoke makes you recoil, you're not alone: One study found that smoking in a home can reduce its resale value by up to 29%. That smell of cigarettes long past isn't, in fact, just a smell—it's a residue called thirdhand smoke (THS). "The lingering odor isn’t just unpleasant; studies have also linked it to cancer," says Joshua Miller, director of technical training at Rainbow International, a home restoration company. Worst of all, the effects just don't pass. "You could breathe in several hundred nanograms of these carcinogens long after the last cigarette burned out," says Miller. Just how long afterward? In one study, researchers at San Diego State University measured thirdhand smoke pollutant levels in smokers' homes after they'd moved out. These pollutants remained even after the homes had been cleaned and vacant for two months. True, THC levels had diminished in that time, but they were still present at higher levels than in nonsmokers' homes. Sellers are not required to disclose that a home has housed a smoker, so if you're worried about it, be sure to keep an eye—and nose—out for it. A smoky smell is an obvious sign, of course, but a strong smell of Febreze, air fresheners, or other fragrances could mean that the seller is trying to mask an odor. A fresh coat of paint can also mask cigarette odors, but they will eventually return. Ask your home inspector to give you his opinion about whether someone has smoked in a house you are interested in. You are totally within your rights to ask the seller's listing agent directly; a reputable professional should not lie about the condition of the home. Should you buy a smoker's house? When you're deciding whether to buy a smoker's home, you should weigh not only the health risks, but what's involved in getting rid of cigarette smells. Even if you're getting a good deal on the price of the home, it'll take some concerted work to eliminate the odor. 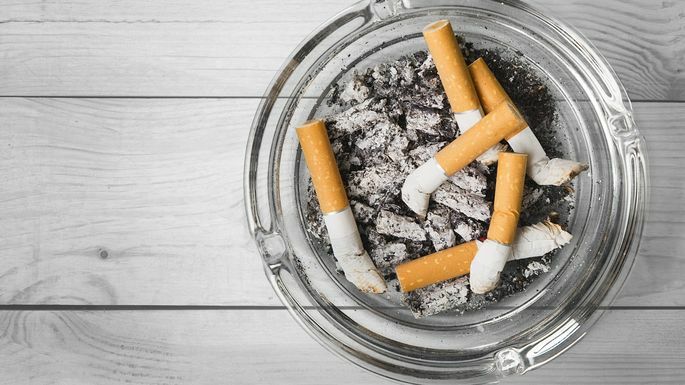 Getting rid of cigarette odor isn't easy, since it seeps into everything. Cleaning can help, but replacing entire systems may be in order. Here's what you can do to eliminate thirdhand smoke. "Clean the air ducts," says Ciresi. "Professional air duct cleaning is an effective way to eliminate odors that manifest when you turn on the furnace or AC." Change the filter on your HVAC unit. Normally, you would do this every few months. If you're trying to fight the smell of thirdhand smoke, step that up to every 30 to 45 days. Clean the evaporator coil. "Fumes can be pulled into the evaporator coil of an HVAC unit. The odor permeates the coil, and blasts the smell of cigarettes every time you run the air conditioner," says Ciresi. If nothing else fixes the problem, you may need to replace the system entirely. Of course, replacing your HVAC isn't cheap. Expect to spend anywhere from $6,000 to $18,000, depending on your home's size and the climate where you live. "Ceilings can be the biggest culprit in a persisting smoke smell in a home, since cigarette smoke tends to travel upwards and latch onto the first surface it comes in contact with," he explains. Smelly dust can fuse onto lightbulbs as they get hot, so change them out. Windows can also retain a smoky film that emits odor when they're warmed by sun, so be sure to give them a thorough washing. Blinds can also be washed with vinegar or TSP—or, better yet, throw them out. If washing doesn't eliminate the smell from walls and ceilings, then your next best bet is to repaint them all, first sealing in the smell with an odor-neutralizing primer like Kilz. Without the layer of primer, the smell will eventually seep back through the paint. "You can sprinkle a deodorizing powder like baking soda on carpets," says Miller. If that doesn't work, try a professional steam clean. In the worst-case scenario, the carpets will have to be replaced. Fabric tends to hold onto the smoke smell, so you'll probably need to clean all the window treatments. Depending on the fabric, some can be washed in the washing machine, while others have to be steam cleaned. You can rent a steamer, or hire a professional to take care of this for you. If cleaning doesn't completely get the smell out, they'll have to be replaced. Ciresi also recommends getting an indoor air filter, preferably with a HEPA filter and charcoal odor prefilter. A dehumidifier can reduce smoke smell in humid weather.